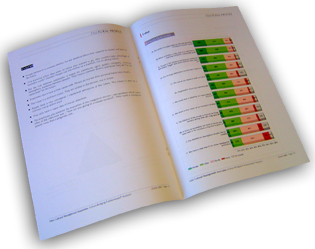 The Internal Opinion Survey provides an organization with feedback on the overall satisfaction and motivation levels of employees, on several themes defined during the preparatory process. For example: knowledge and engagement in the company strategy; perception of leadership and management; proximity management; HR evaluations and systems; motivational factors, and so on. This survey can be occasional or recurring. It can be used in the context of high performance or with dysfunctional organizations. It is always tailor-made to suit our clients’ requirements and objectives, and drawn from referential questions in our database. ICM accompanies its clients in communicating the results and contributes to the commitment made to the actions undertaken. Thus, the opinion survey is a means to spur motivation, and an organizational tool. The evaluations are web-based, anonymous, and confidential.